I voted for “blog post” because I heard about “Shape of Design” from Craig Mod’s post “Hack the Cover.” Although I had to think about it for awhile, because I read a bunch of books at once. It’s good that this poll asks about the LAST book you read, because there are so many books we read and a bunch of ways we discover books. It would be interesting to see a log of how you discovered ALL the books you’ve read. Whenever I buy a book, I am going to keep a log on this blog post’s comments with where I heard about that book. And for cases where I put something on my Amazon wish list, I’m already in the habit of adding a comment on my wish list about where I first heard about the book. This will be fun. I encourage everyone to keep track of where they discovered each book you read. In physical books, I write on the back page where I got the book from and the date. I wish eBooks had that feature. I suppose I could make a note in the eBook. Maybe I’ll keep track of the date purchased, where I purchased the book from, and how I discovered the book. Hmm, it seems like goodreads should have a feature for this. Then they could do a cross-data analysis of all book discovery. It would be great if they would share their reports like how okcupid does very interesting reports on how people use their site and what sorts of people like. 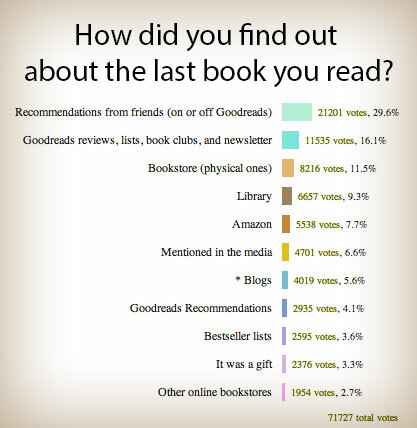 That way, goodreads then can analyze how people discover books, and which types of books get discovered in which ways. I’d imagine it would be very valuable information for goodreads to share with publishers and readers. I hope they respond–or better yet, that they actually implement this. Knowing you, Matt, you would do this anyhow;)…But for the record, I’d REALLY be interested in reading/seeing any reply that GoodReads sends your way!! Great idea! Thanks Sarah! They did respond! I’ll paste their response into another comment on this post. NOTES: Around the middle of 2012, I found 14 of these essays online. (I can’t remember exactly how) I enjoyed several of the essays. And now in September 2012 I found out that there are more essays added to the book via this tweet, https://twitter.com/screenkapture/status/245592065793196032. Even though I have the PDFs of the 14 original essays, I’d like to support the authors behind this book by having a bought copy. NOTES: Discovered this book from http://cyberbrethren.com/2012/09/26/evangelicals-discover-luthe/ and http://www.geneveith.com/2012/09/26/an-art-critic-discovers-luther/ I read these blogs via their RSS feeds on the iPhone Reeder app. NOTES: The author/editor of this book is a friend of mine from college. I didn’t even know she did a book until I was looking at her profile on goodreads.com. NOTES: While researching for a blog post about “edition of one million” I came across this book on google. NOTES: I’m currently re-reading “Zero: The Biography of a Dangerous Idea.” I really enjoy how the author dances through ranging topics of math, numbers, history, religion, etymology; while writing in a style using engaging and interesting stories. NOTES: After adding David Scaer’s book on baptism to my wish list, I looked around at his other books and found this one. I would like to hear a Lutheran’s take on the book of James. NOTES: My bible study group is covering Deuteronomy. I did search on Amazon to see if Martin Luther wrote anything about Deuteronomy. This book came up. NOTES: As I will be leading my bible study group’s discussion on Deuteronomy 4:1-43, the research on this passage lead me to an interesting sermon, “Two-Kingdoms Activism” By John Eidsmoe http://www.lutheransforlife.org/article/two-kingdoms-activism/ One of the footnotes refers to this book. NOTES: I came across this book while doing research on the history of “O Christmas Tree” for my 2013 Christmas card. I apparently pulled some rare lyrics for this song that are only mentioned three times on Google. One of those instances is in this book. NOTES: Mentioned in blog post: http://www.mightybytes.com/blog/entry/better-marketing-2014 (discovered blog post on Google Plus). It was $3, so I just bought it outright. 6) A commenter on the blog post recommended this book. NOTES: Nate Silver mentioned he wrote a book on his blog post. http://fivethirtyeight.com/features/what-the-fox-knows/ This blog post was shared with me from James P.